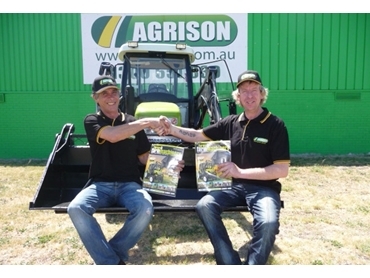 Melbourne-based Agrison made the front cover of Farms & Farm Machinery, Issue 288 with the launch of its latest 60HP Ultra G3 tractor package. The 60HP Ultra G3 tractors offer an exceptional 60-horsepower, direct-injection diesel engine, with turbo, euro cabin design, air-conditioning, 3-point linkage with hydraulic up/down, 2-speed PTO, 4WD and front-end loader with 4-in-1 bucket. Engineered specifically to offer versatility, performance and comfort, Agrison’s 60HP Ultra G3 tractors offer a cost-effective solution to hobby farmers as well as large acreage owners. According to Agrison General Manager Allan Yokus, the release of the new tractor has received great response with the team working hard to keep up with current orders.